Other than wining and dining in the Okanagan region, there exists a therapeutic haven where you can take a break from wine tasting. A view of the main building from afar. The Okanagan Lavender and Herb Farm welcomes you with the unmistakable scent of freshly snipped lavender. The retail shop showcases delicately merchandised bottles of essential oils and distilled hydrosol body mists, lavender eye masks and delicate bushels of fresh lavender by the till. Andrea, the Founder of Okanagan Lavender and Herb Farm, took us into the workshop behind the retail shop, to see firsthand how oils are mixed into bath salts. We then went for a tour of the farm. 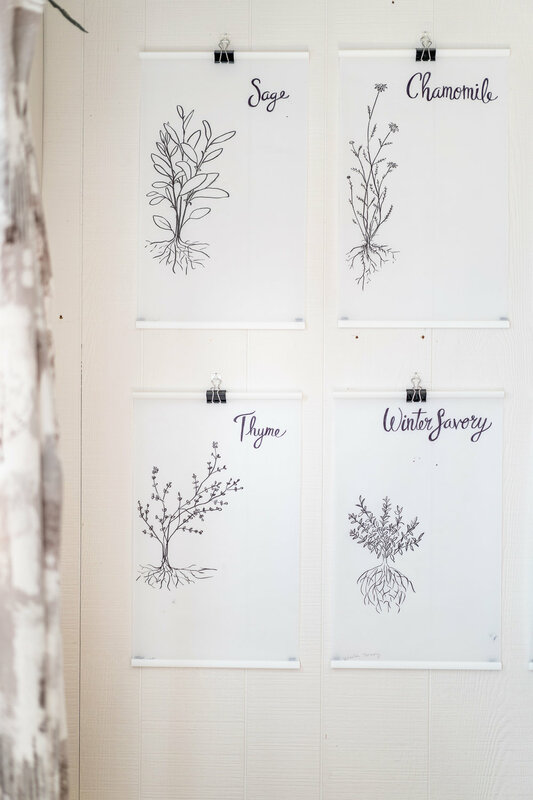 Andrea’s grandpa’s desk still sits in one of the small houses , with hand-drawn illustrations of the various herbs grown on the farm gently pinned onto the wall. The workshop space with vibrant potted plants lining the path. We then stopped to smell some of the herbs growing in small pots lining the walking path. Andrea picked a leaf from a lemon verbena plant, and the freshness of the leaf was like nothing I had ever smelt before. The strength of the herb was intoxicating, leaving on reinvigorated and feeling alive. The sweet, citrusy scent awakens the mind, instilling an instant energy boost. Andrea shared the changes that has happened to the property over the years, sharing that her father and brother founded Quail’s Gate Winery, and she had gone on to create the lavender farm on the 8-acre property on which we stood. On the property you would find roses, thyme, basil, spearmint, rose geranium, different types of lavender such as Lavandula Angustifolia and Lavandula x. intermedia. As part of our tour, we went through a workshop that taught us how to mix our own essential oils, hydrofoil mists and bath / foot soak. Baskets of fresh herbs sat on the workshop table, lavender, thyme, spearmint, rosemary and roses. We used gardening scissors to snip herbs to put into a small linen bag. I mixed thyme, rosemary and lavender into my little packet, which Andrea then helped us iron shut. 5 different hydrosols used to create our own hydrosol mist. The next step was to learn how to blend Hydrosols, which are distilled aromatic waters from botanical material. There were 5 different hydrosols to choose from to create our own blend, and using lavender as a base, added refreshing spearmint to my blend. The process of creating my own have reminded me of the sense of play we all experience in our childhood, where we were open to creating new things bound only by our imagination. The last part of the workshop showed us how to blend our own essential oils, where you use sweet almond oil as a carrier oil to dilute the essential oils to a level where it is safe to use directly on the skin. Select essential oils will burn your skin when applied directly onto it without dilution, so before applying oils onto your body you must inquire to see if it’s best to use with a diffuser instead. Fresh lavender bushels you can buy to treat yourself. We completed the workshop with a sense of satisfaction, feeling like we just created something new and picked up a variety of plant knowledge from Andrea, our attentive teacher. 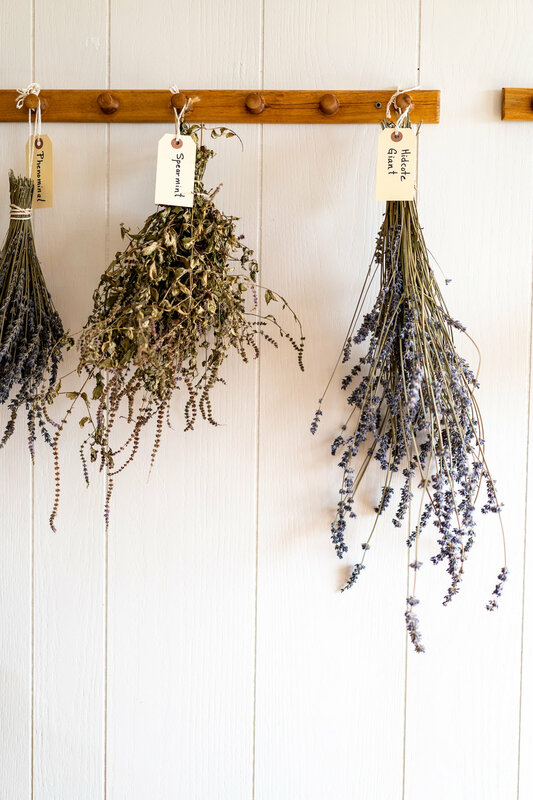 If you are looking for a calming break during your Okanagan travels, the Okanagan Lavender and Herb Farm tour and workshop are just what you need. Wander down the gentle hills housing the aromatic herbs, or spend some time in the workshop creating your own essential oil concoctions; either way, we guarantee you will leave refreshed.